Aww. I love his shirt! Haha. That is too cute. 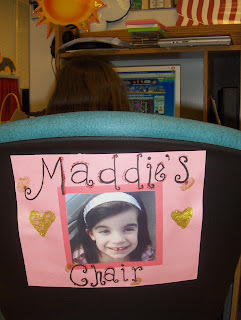 And that picture of Maddie on the back of the chair is SO cute! She is adorable. That Fletcher is so smart! I love your videos!! 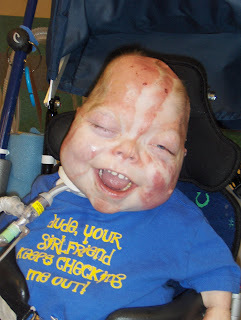 I remember when he used to hold his breath to make the vent beep so we would come in his room and play with him! Right when we would get in there, he would resume breathing and smile really big! 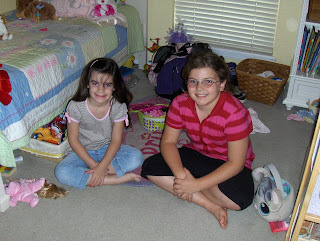 By the way, Maddie is so beautiful! What a great big sis for helping Bubba! That shirt rocks. I love that Maddie wants to help Fletcher and be a part of his life. TCC seems to be a very loving place. That has to warm your heart tremendously.